Going Green! 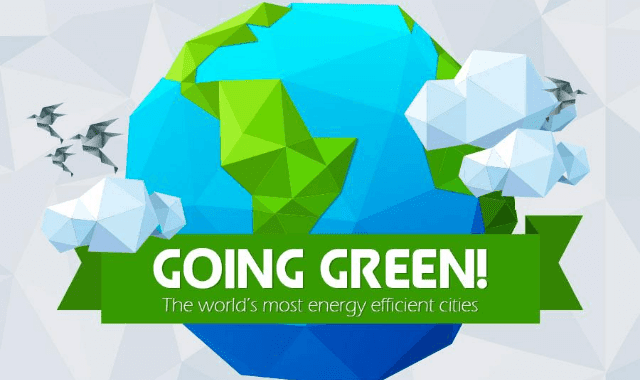 The World’s Most Energy Efficient Cities #Infographic ~ Visualistan '+g+"
Climate change is such a topical issue at the moment, not least because of the extreme weather conditions that we are experiencing all across the world. We have seen widespread flooding, storms and other out of season issues like unusual temperatures for specific times of the year and climate change is to blame according to world experts. As a result, governments of the world have had to sit up and take note and make provision and plans to tackle it. In recent years, we have seen attempts at this but continually they ran into problems, not least due to industry backlash. The recent agreement in Paris (COP21) is hoped to have heralded a new beginning in the fight against the issue with the main powers that be in terms of world leaders producing something workable for all. We recently produced this infographic which highlights those cities which are deemed to be the most energy efficient. This has been measured across a number of metrics but we hope it makes interesting reading…check it out!